A large, somewhat disjointed conclusion to the musketeers' stories; very low morality. In the 1660s, the four renowned musketeers of France stand on the threshold of old age - but are still just as active, mentally and physically, as they were in youth. When Aramis learns of attempts by Louis XIV's finance minister, Colbert, to overthrow Aramis' friend Nicolas Fouquet, he hatches a brilliant and dangerous plan to save Fouquet. He capitalizes on his knowledge of a state secret - the existence of Louis XIV's identical twin brother Philippe - to organize a swift, silent coup that will place Louis in the Bastille and Philippe on the throne. But when they are betrayed, Aramis and Porthos must run for their lives; and when D'Artagnan is sent to capture the rebels, it will take all of their ingenuity and loyalty to escape the net being drawn for them. Much of the plot is based around the plan to overthrow the king; however, the morality of this becomes stickier when Aramis argues that Philippe, as Louis' twin, has an equal right to the throne. D'Artagnan holds that the king (Louis) is divinely ordained to rule and obeys him faithfully, at least in word, if not in spirit - though he's not above reprimanding Louis when he feels the need. A great deal of plotting and backstabbing goes on at court, especially on minister Colbert's part as he attempts to bring down the "Surintendant," Fouquet. Fouquet himself is portrayed as a noble gentlemen with a strict code of honor, generous to his friends and loyal to the king, although it is not made clear whether he is in fact embezzling. A subplot (though important enough to be its own plot, really) involves Athos' son, Raoul, and the woman to whom he was affianced. She is unfaithful, falling in love with the (married) king and becoming his mistress, and defends her actions on the strength of that love. Raoul, losing interest in life, attempts to get himself killed. The highest moral code that the musketeers know is that of friendship: even Aramis, who most of the time is a self-serving, self-absorbed egotist, is devoted to his three friends and deeply regrets having dragged Porthos into the ill-starred affair. Aramis is a bishop and the head of the Jesuits, but he is hardly a model character and tends to reflect society's low opinion of Jesuits at the time. Athos is very pious, but his piety is of a fatalistic kind; thus, while he mentions God where others tend to talk of Heaven or Providence, Christianity is not really portrayed. He also idolizes his son to the point of saying that he would curse God if he saw Raoul die. There is talk of "good" characters earning favors from God, or deserving Paradise, etc. 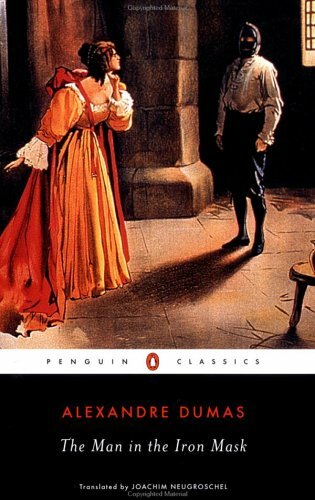 The religion in this book, as in Dumas' The Count of Monte Cristo, is one of Love. Everything, including adultery and suicide, is justified because of love. There is a general idea pervading the story that all will be forgiven a person if they acted on the strength of this emotion, without any consideration for concepts like sin and moral, or even natural, law. Even the general ill-will that the musketeers feel toward Louise, Raoul's fiancee, is based more on the fact that she unintentionally hurt Raoul than on her unfaithfulness per se. At one point D'Artagnan, fearing he will be disgraced, asks someone to shoot him and threatens to do it himself. Later in the book there is a battle and two central characters must fight for their lives. Athos has a vision of a battle and sees the bodies of the dead. Both of these descriptions are semi-graphic, but in a manner typical of an adventure and drama. A character is crushed beneath falling rocks. Another is shot, and seems to commit suicide by directly disobeying the physician's orders. A character dies during a siege, as shown in the epilogue. Great amounts of alcohol are consumed at dinners. Characters sometimes purposefully have others drink to excess in order to make them talk. Fine wines are mentioned. Again, there are numerous intrigues at Louis' court and it is quite obvious that he is not faithful to his wife. In fact it appears that nobody is. It's implied that he was once involved with his sister-in-law, but at the time the story takes place he has made Louise de la Valliere his mistress. Raoul, trying to find out what is going on, discovers their secret room and muses on what must go on there. Fouquet is said to have a mistress. Raoul's best friend is involved with a married woman, which is excused, again, on the strength of "love". Athos accidentally walks in on a shopkeeper's mistress while she's dressing. It is implied in the epilogue that Louis' younger brother (not his fictional twin brother) is involved with another man, which is historically accurate. For the musketeers, all dalliances are in the past, so the book is fortunately lacking in the constant talk of mistresses present in The Three Musketeers. Numerous cases of God's name being taken in vain, especially in French. "What the devil" or "deuce" is also used semi-frequently. "The Man in the Iron Mask" is the last part of Alexandre Dumas' heavily fictionalized account of the historical musketeer D'Artagnan, and as such would be better titled "D'Artagnan's Last Hurrah." The actual man in the iron mask, apart from not getting a mask until about five hundred pages in, is more of a catalyst to the plot than anything else. Indeed, the plot is not very cohesive or well-developed at all, having as much to do with la Valliere, Colbert's machinations, and the beginning of the "personal rule" of Louis XIV as it does with the plot to place Philippe on the throne. It does pick up the pace some four hundred pages in, when Aramis and Porthos are fugitives, but the ending brings with it little resolution to what the title claims the book to be about. Positively, "The Man in the Iron Mask" presents Athos, Aramis, Porthos, and D'Artagnan as seasoned veterans: still clever, still brave, but perhaps not so brash as they once were. Their interactions and the depth of their friendship help redeem the story, though that does not make fascinatingly witty all seven hundred pages of weighty narrative and back-and-forth dialogue. And, as one can easily find out by reading a little of Dumas, he's not the classic author to go to for reasonably firm morality or theological insight. Still, for those who have enjoyed the exploits of the (four) musketeers in the past, this may be a worthwhile read for closing out their story.